Up for an Out-of-the-Box Summer Challenge? Now that the weather is (hopefully) turning a bit and we are finally seeing a glimmer of Summer here and there in the Great Northwest, we thought we would share some super fun-in-the sun events going on around town this year to help keep staying fit and healthy a FUN activity for you and your family. These are not run of the mill runs and walks, so be prepared -- and have fun. 1) DoveLewis summer fitness events: I have a special soft spot for this organization and their events so they are top on my list. Since I have a lab, the Tour de Lab is the event of choice. Tour de Lab is a bicycle tour of all three Lucky Lab brew pubs this year on September 11th. "Enjoy human treats along the way as you make your way to the finish line festival with a make-your-own hot dog extravaganza. Free pint glasses, dog ears and funny dog noses, for all riders." How fun does that sound?!? For more on DoveLewis events this summer, including Run for the Love of Dove, Corgi Walk & Westie Walk, click here. Need a new pair of walking shoes before hitting Dove's summer events? Click here for the Aries Apparel online shoe store! 2) Starlight Run, 4th of June. An annual Portland favorite amongst families and recreational runners. Named "Largest 5K" fun run in Portland, this Rose Festival race gives out awards for best group and individual costumes! 3) Mud Run MS-Portland. This wild new event, Mud Run MS Portland, is different than any adventure race the Pacific Northwest has seen, taking place on a 6.1 mile boot camp style course with over 30 obstacles. Compete as an individual, or put together a team of two or five. Join the Competitive (Trophy) Division to slide your way onto the trophy podium, or sign-up for the Recreational "Don't Give a Poop" (DGAP) Division and splash through at your own pace. Participants of all skill levels are welcome to have some good, dirty fun!" Need I say more? See picture of our friends who participated last year while rocking Aries Apparel Funkadelic bras and spandex shorts!! Mud Run MS is held this year June 18th. 4) The Great Urban Race: Amazing Race meets your local city in this adventure-style race around town coming to Portland June 11th. Each team will be given an envelope that contains twelve clues ranging in difficulty at the start of the race. The clue sheet will contain a mixture of clues – some physical and some mental. This event is meant to be fun and silly and do nothing but challenge your mind and body! 5) Pineapple Classic 5K on August 13th in Canby, OR. Join us for a fun, Hawaiian themed run with obstacles. And after the race, there’s a luau with a beer garden and entertainment! Compete for speed, compete for the best costume. Have a blast while helping to save lives!" A benefit for the Leukemia and Lymphoma Society (another organization close to our heart!). 6) Mt. Tabor Doggie Challenge. Taking place Saturday July 30th, in one of the hottest parts of the summer in Portland, this 8K or 5K run or walk "is truly the coolest Summer running event in town. Partly because it takes place on shady tree lined roads within the park, but also because there is great music, tasty beer and yummy food after the event!" 7) Relay for Life: another popular event for all fitness level participants who want to help fight cancer while staying healthy. Click here to find the nearest relay near you this year and stop at Aries Apparel for the latest in fitness gear. 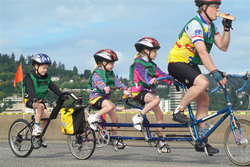 8 ) Providence Bridge Pedal 2011: With bike rides of 13 to 36 miles, as well as a five-mile walk, the event offers choices appropriate for everyone. Depending on your event, you bike over all the bridges in the scenic city of Portland, aka 'Bridge City USA'. 9) Warrior Dash September 10 and 11, 2011. Oregon Sports Authority says, "Warrior Dash is the ultimate event for thrill-seeking athletes. This running series is held on some of the nation’s most demanding and unique terrain. Participants will conquer extreme obstacles and celebrate their feat with music, beer, warrior helmets and muddy shorts." 10) Playworks Portland Corporate Kickball Tournament. Held at PCC's Rockcreek campus on June 17th, "Corporate Kickball means spending the day outside of the office, team building and bonding with co-workers over something besides work! You can support our anti-bullying and anti-obesity efforts as we teach conflict resolution and healthy play by bringing your Corporate team out to play." Looks like a visit to the Workout Gear department of Aries Apparel is a must-do before playing in this tournament!